Berry reports that Pilgrim Hall is coming along nicely and that it was wonderful it was to visit Hammond in New York despite being sick. She has asked Mr. Green to send the names of the teachers because Mrs. Hammond wants to send them cookbooks. 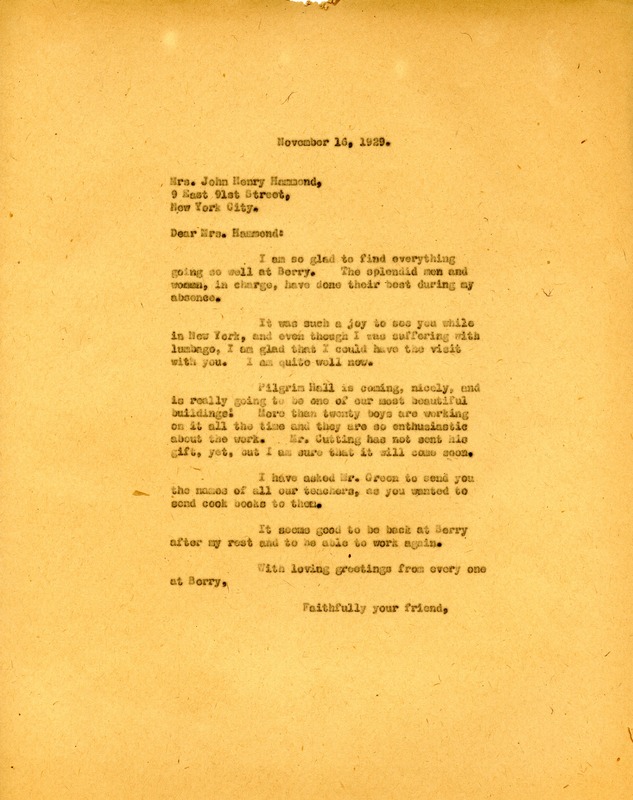 Martha Berry, “Letter to Emilt Vanderbilt Hammond from Martha Berry.” Martha Berry Digital Archive. Eds. Schlitz, Stephanie A., Sherre Harrington, Ashlee Nollette, et al. Mount Berry: Berry College, 2012. accessed April 19, 2019, https://mbda.berry.edu/items/show/10190.